Pleasingly plain Pudding Pops! 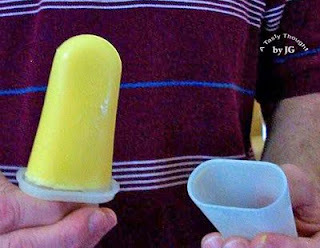 On a warm ... o.k.... hot day opening the freezer door and locating refreshing Vanilla Pudding Pops even sounds like a cool idea. It sure is an easy idea. My Tupperware molds, 1 box of Cook & Serve Jell-O Pudding and 2 Cups Milk were located and I was on my way. After the pudding was prepared and it cooled a few minutes, I poured it into the molds. Snap on the tops and place in the molds' tray. After a few hours in the freezer a refreshingly cold dessert awaits! Time to make more Pudding Pops! Maybe chocolate! It's July! It's HHH and the local Blueberry crop tastes delicious! Our supply of the local sweet juicy Blueberries for the year is now stored in the large freezer downstairs. It's a tad too warm to use the oven, so my little griddle was put to work. This AM Blueberry Buttermilk Pancakes tasted delicious! Below, the third pancake is ready to flip over. After my DH & I enjoyed our breakfast the remaining pancakes were cooked. The photo on my blog masthead gives a wonderful idea as to the quantity of delicious light pancakes (with a small amount of Cinnamon & Nutmeg) one batch yields. The extras are cooled, packaged and placed in our freezer. 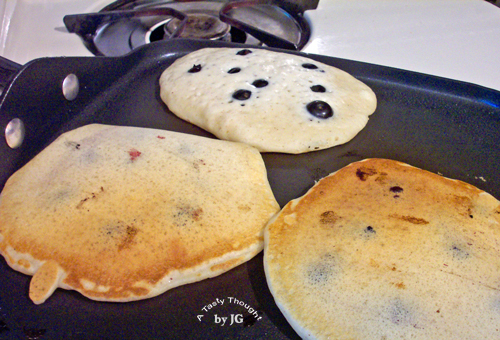 Earlier this summer when I was redesigning my blog, the large plate of Blueberry Buttermilk Pancakes kept coming to mind. I had to include it. This afternoon Blueberry Freezer Jam is on the agenda. Two batches will be made - each batch made separately. I like this 24 hour method so much better than preserving the Jam using the method my mom & sister used during my childhood. No stirring over a hot stove any more. Our supply of Blueberries are so juicy and delicious that next week we will probably purchase more to enjoy now and to freeze to enjoy later in the year. Are Blueberries one of your favorite fruits? Summer surely brings a more leisurely pace. It's also a "Summer of Culture" for my DH & me. The lawn had been mowed and the perennial gardens looked fine, so on Thursday we drove to Boston to visit the totally awesome Chihuly Through the Looking Glass exhibit at the Museum of Fine Arts Boston. 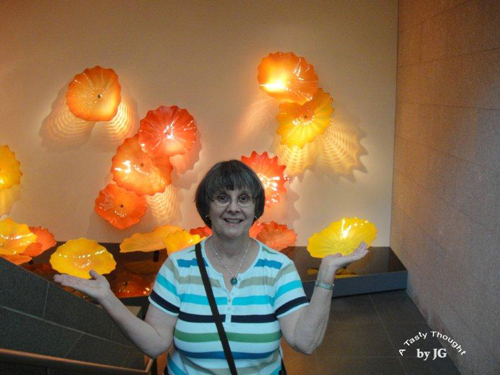 As we walked down the stairs, the entrance to the galleries containing Dale Chihuly's gorgeous blown glass works of art was so enticing. It was a wonderful opportunity to view and to appreciate so many pieces in many different colors, styles, sizes and shapes. It's a wonderful exhibit on view through August 7! The next day we were back to our routines. In the fridge Zucchini waiting to be shredded and used to bake a double batch of moisty delicious light Raisin Zucchini Muffins. Baking a double batch works so well, because the majority of them are placed in our freezer after they have cooled. Nothing is better than grazing in the freezer on a HHH summer morning and locating a nutritious light homemade muffin. 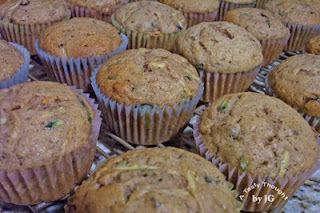 The recipe that I use has been adapted from Janet Pierce's Zucchini-Chocolate Chip Muffin recipe. However, I ignore the chocolate and use Raisins. Egg Whites and Olive Oil plus a couple other changes are made. (2 Egg Whites = 1 Whole Egg, when baking.) This recipe is for 1 batch of 12 moisty yummy muffins. Now, Raisin Zucchini Muffins are located in Freezer Ziploc Bags in our freezer in addition to the tasty treats that we've been enjoying. Our local produce is now available at roadside stands, so fresh Zucchini will be located in our fridge. :) Do you purchase the fresh Zucchini? Every morning this summer a Whip-poor-will's melodious song entertains us while we are eating breakfast. Listening to this beautiful call is now an AM routine for my DH & me. Today I listened while adding a few more items onto our grocery list. One item was Tofu. After getting our dose of culture at the Met two Sunday's ago, we stopped into the cafeteria to grab a bite to eat. The Tofu Wraps in the case caught my attention! For quite a few years tofu was a staple on my grocery list. During the winter months at lunchtime "Unreal Egg Salad" on Raisin Bread tasted divine. So, looking into the "wrap/sandwich case" and spying a wrap filled with tofu sounded wonderful. It was! This wrap also contained a few Craisins and lettuce. 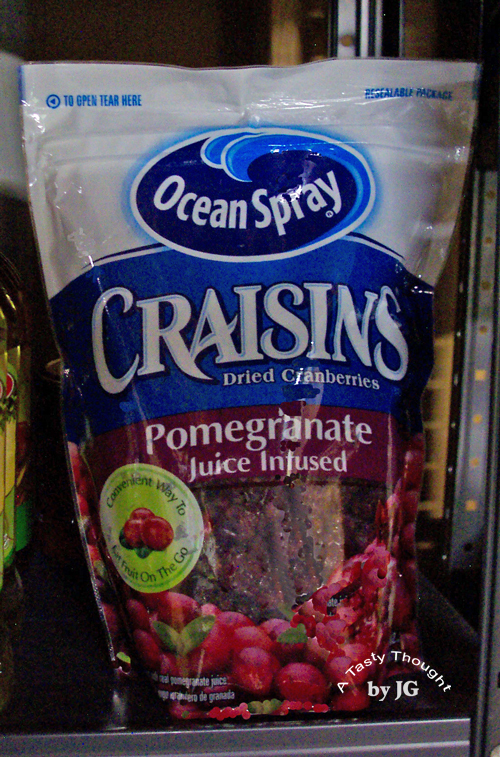 This past week Craisins with Pomegranate Juice was featured at our local Costco. Now, Craisins are a staple in my pantry and they were on my Costco list. At that moment I envisioned a Tofu Wrap including about 5 of these Craisins. Into the cart the package went! A package of tortillas are always located on the bottom shelf in my fridge. This week we will enjoy a Tofu Wrap! With Craisins! Cut about 1" slice firm Tofu into very small pieces. After placing Tofu pieces in a small bowl, add Ground Mustard and Paprika, stir. Add desired amount of Mayonnaise. Place in center of tortilla, spread. Add 5 Craisins and lettuce. Fold over 3/4" two opposite sides of tortilla. Now starting at one unfolded end roll filled tortilla to opposite end. Enjoying the Tofu Wrap reminded me how much we always enjoyed Unreal Egg Salad on Raisin Bread. Definitely needed to be placed on my grocery list. After opening the Tofu package and taking the desired amount, store the remaining Tofu properly. Place in a container that has a lid. Add cold water to cover Tofu. Place the lid on and store in the fridge. Every day the water is drained and more cold water added to cover the Tofu. Small chunks of Tofu also taste great in a veggie salad! Earlier today while making the Tortellini Salad for dinner I was reminiscing about our recent visit to the Metropolitan Museum of Art in NYC. It's wonderful to stop in while visiting our son in the city. :) My fam knows all too well that I loose track of time whenever I have the opportunity to learn more and get a bit of culture! Learning while having fun! Summer is a great time to continue to learn about new topics and also investigate a bit more. For those of you who live in Massachusetts or plan to travel to Massachusetts this summer you may be interested in the opportunities that the Highland Street Foundation is offering - Free FUN Fridays 2011. Each Friday this summer, there are a group of interesting places throughout MA to visit - free of charge. In the brochure each Friday date is listed and color coded with the locations that can be visited without paying an admission. Click on any specific cultural attraction to learn more about it. As I was thinking about the cultural attractions that we have visited in the past that are included on this wonderful list, the tri-colored tortellini were boiling away. The Springfield Museums and Museum of Fine Arts Boston are two of my faves, just as Tangy Tortellini Salad is always a summertime treat. A package of frozen Tortellini is a start to this fave salad. The directions are easy and easy is good! Drain, rinse with cold water, drain again. 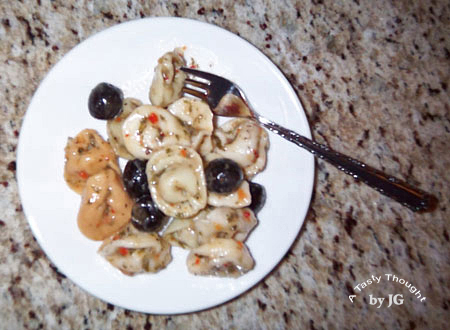 Place Tortellini in a bowl. Add about 1/2 Cup Italian Salad Dressing, stir. Add Black Olives, cut in half. Add Garlic Powder & Parsley, stir. Cover and refrigerate for at least 4 hours, stirring once or twice. If needed, add a little more Italian Salad Dressing before serving. This is a great pasta salad to enjoy along with dinner on a hot summer evening! And ... a little culture is both fascinating and informative! I store these bars in my fridge. Ohh, they usually do not last long! These scrumptious easy treats are very sticky while making. For that reason I do a bit of prep work before beginning. My rose colored Pyrex glass baking dish (about 9"x15") is sprayed lightly with PAM and any extra PAM is wiped with a paper towel. The required ingredients are measured and "ready to go". After I've finished using my measuring cup, I spread a little PAM or margarine or butter on the bottom with the paper towel. I use the bottom of the measuring cup to lightly press the mixture in the baking dish. Nothing will stick. Spray a glass baking dish (about 9"x15") with PAM. Add in 4 Cups Miniature Marshmallows, stirring until melted. Add in 3 Cups Rice Krispies Cereal and stir. Add in 1 Cup Raisins, stir. Then, add remaining 2 and 1/2 Cups cereal and stir. Place mixture (will be sticky) in baking dish and press lightly. Cover top of baking dish with Glad Wrap and refrigerate for at least an hour. Cut into bars and place in covered container to store in fridge. 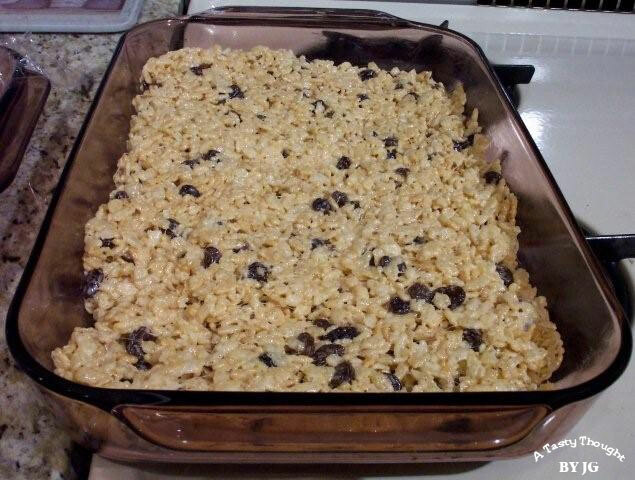 Sometimes we enjoy warming a cold Raisin Rice Krispies Bar (on a small plate) in the microwave for about 10-15 seconds before eating. Yum! The rice cereal and the marshmallows were in our grocery cart this week. Time to take out the large Rose colored Pyrex!